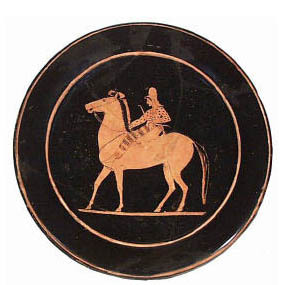 Painted plates tend to be common only in the sixth century. Examples with holes drilled into the rim were suspended for display, probably in a religious or funerary context. Pinax (pl. pinakes) is the Greek term, although this is also used for planks or wooden boards, such as those that carry wall-paintings. From the late fifth-century, 'fish-plates' occur in the Athenian repertoire. They stand on a low foot and the interior slopes gently towards a shallow central depression. They are named after decorated examples, which reveal their use. There are many examples from South Italy as well; the Athenian can be distinguished by the depiction of the fish with their bellies towards the rim, whereas those from South Italy are rendered with the bellies facing inwards.